We Need The Standard Things . . .
. . . help with taking care of the piggies, cleaning cages, vet trips, and help with getting the word out about adoptions. We also need monetary donations to help pay for supplies, food, bedding, hay, and veterinary expenses. But we especially need BEDDING! 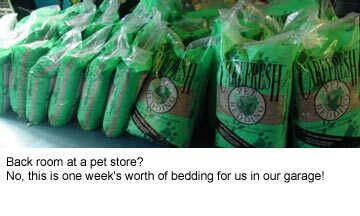 We go through approximately 20 bags of CareFresh a week at cost of $300 a week. We refill the refrigerator every 2 to 2½ days at a cost of approximately $150 a week. Please help us help the piggies. It is a huge financial burden and both Cavy Spirit and the piggies would appreciate any help you can offer. Since 1999, we at Cavy Spirit have given of our time, our money, and our lifestyle to help save guinea pigs both locally and by helping to share information and resources internationally. We started our rescue when times were brighter and our income was higher. We currently estimate our annual cash outflow for the rescue at $25,000 to $30,000. We have avoided banner ads and all manners of advertising as we try to keep our site and our rescue as commercial-free as possible in order to maximize content and keep a focus on the guinea pigs. We will be adding a couple of services in the near future to help encourage donations while providing additional value. Rescue persons and groups tend to come and go over time because of burnout. Burnout of money, time, resources, and emotions. We want to keep Cavy Spirit going, but we really need some financial help. You can donate directly to us with PayPal. PayPal is easy to do. You can use a credit card or your checking account. Use the following button to make a one-time donation using PayPal. You can make automatic monthly donations from your credit card or checking account using PayPal. Choose the monthly amount you prefer and PayPal will step you through the simple process. Checks are always welcome! Please call or email us for our address. You can use a credit card to call in a donation to our account (Cavy Spirit) at American Pet Diner (1-800-656-2691). We get all of our hay and sometimes pellets at APD. We usually buy approximately 200 pounds a month of Timothy 2nd Cut Hay. Cavy Spirit Needs YOU! Help Us get the word out! Please go to the Poster page and print out multiple copies. This page is designed to be printed directly from the internet. There is no 'back key' on that page. Please use the Back button on your browser to return here. Also, this is not just a giant graphic. We have created the page so that if you want to create your own rescue poster, you can look at the html or download and use some of the graphics. If used on your website, PLEASE give credit to the Muze Arts guys and add a link to www.CavyRescue.com. That's all we ask. Vets, animal hospitals, other rescue places, even Humane Societies, SPCAs, pet stores, any animal related place or service, schools, preschools, daycares, community areas, at work, grocery stores, drug stores, just about anywhere! 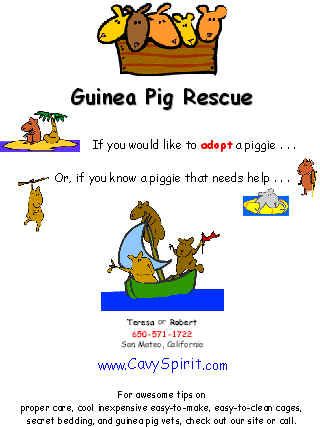 SHOP Your Way to Saving a Guinea Pig! iGive.com has a great program. All you have to do is do your shopping at iGive.com and you'll raise money for Cavy Spirit automatically! Think of how much money could go to Cavy Spirit if our supporters bought pet food, toys and other essentials for their beloved cavies and other pets at www.iGive.com/CavySpirit, where a % of every purchase is donated to Cavy Spirit! At iGive.com, membership is free and private! So hurry up and visit the Mall at iGive.com, where you can shop at 240+ stores, including The Ferret Store, Pet Food Direct, All Pets, SitStay.com, CatToys.com, Barnes & Noble, Amazon, Front Gate, Sharper Image, CDNow, and PetsMart! You name it, they have it! The prices and policies are the same as going directly to the vendor's website, in fact you are at their website, just through iGive. Each vendor contributes a small amount to the organization you designate, usually around 2%. It's easy, just go to iGive.com and select Cavy Spirit as the cause to receive the company's donated percentage and then GO SHOPPING! You'll help our economy right now, too! The donated portion is NOT added to your purchase price and much of the merchandise is already discounted. And every time you refer a person to iGive and they support Cavy Spirit by shopping within 45 days, we receive $1. Send someone you think may help this tell-a-friend link for Cavy Spirit to get tell-a-friend credit. More and more rescues and shelters are closing and cutting back every day (story). More and more animals are being euthanized every day. This is becoming a disaster for the animals. Please help us stay active in rescue by contributing what you can. There are many easy ways to help.